One of my husband and my favorite things to do on the weekend is watch movies we put on Netflix...and boy do I love Netflix! No late fees, no returning the movie to the store, just a quick jot to the mailbox...but I digress...so anyway, it's fun and it's cheap entertainment, and it's our form of zoning out! And in life, you really REALLY need to escape the "real world" from time to time, and whether it's in the pages of a great book or in a movie, I think it can be truly therapeutic! And I have to say I really enjoyed it. Have any of you seen this, especially those of you who live in the U.K.? It is a British T.V. 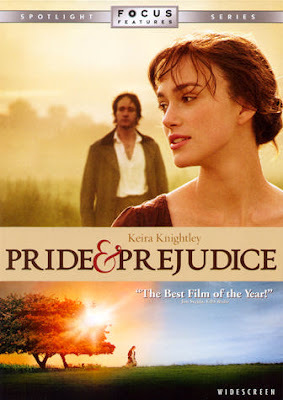 film about a girl named Amanda who loves Jane Austen's book, Pride and Prejudice. One evening, she discovers Elizabeth Bennet (the main character in the book) in her bathroom, and eventually a door that leads into Elizabeth's world. So she gets the chance to essentially live in the story of Pride and Prejudice and meet all the characters...it has some things in it that I really wished they had left out~ it would have been even better without them~ but even despite those things and a few other things that seem a bit contrived, it inspired me to read Pride and Prejudice. I always thought it would be dull, but it is such a great book so far! For though it's true we saw this before, I suddenly feel the need to see it once again! And this was a good movie as well, and as I remember, a completely clean film, which is always refreshing! I can recommend this one highly! So what movies have you seen lately that you loved? And what is your favorite~ comedy, drama, classic, suspense...? i am always a sucker for romance films and would cry a bucket... that's why i love The Notebook, Titanic and Love Actually. I also like The Illusionist. The worst comedy film i have watched is Bruno, yuck! I love, love Netflix, too! I've been a member for about 4-5 years now and have NEVER had any problems. I've recently been hooked on the INSTANT movies that I can watch on my laptop ... I spend more time watching movies than I do blogging! Oops! Thanks for the movie review as I was on the fence about watching it, but will be sure to now. Sounds like a fun movie. Pride and Prejudice (the A and E version) is my all time favorite movie. I've never seen either of these. I tend to like suspense movies.....not gory but just a good scary plot! I love Lost in Austen It's one of my favorites!!!! I have been watching it for over a year now and I still love it. Hey thanks for the wonderful comment on my blog. Boy if you guys haven't been over to Forks/La Push/Ruby beach you really should think about a day trip! It is beautiful country. Thanks for your prayers for my husband-I just want you to know he is all better now...It was just a strange virus???? I have seen that Pride and Prejudice so many times that I can quote practically the whole movie (seriously) I've never watched a movie more then that one!!!! Hope you are having a wonderful week! Glad you guys are getting some down time together watching movies! I have never seen Pride & Prejudice or read it. Maybe I should. The last movie that I saw that I loved was Julie & Julia. I also recently saw Ghosts From Girlfriends Past and it was really cute! My favorite genre of movies are romance. The sappier the better! I love a good love story! DH and I like Netflix too...makes renting moves easy to do. I prefer romantic comedy/romance. When I watch a movie I want to sit back and relax not be on the edge of my seat... I do enjoy movies like National Treasure though, not sure how that is categorized though. BTW, sorry I missed your call... I will call you tomorrow. I love Pride and Prejudice (both the long and the short versions)! I saw Lost In Austen and thought it was cute. We love Netflix too especially the free movies! I came over from Robin's blog and have enjoyed my visit to your lovely blog today. We have never seen Lost In Austen. I don't know how we managed to miss it. We don't have Netfix in the UK but we will keep an eye out for it to buy. I love all the home decorating ideas you share. It's great to visit a blog and get some inspiration. Thank you. I just finished the HBO mini-series John Adams we got for Christmas...FABULOUS. Thanks soooo much for the movie reviews...when I find some spare time I will be sure to check these two out!